Hi guys, I have an M221 and trying to read process data from a HACH controller via Modbus 485. In the Read_Var function block I need to configure ObjType, FirstObj, Quantity and IndexData. Slave ID is 3 and I am using SL2. what do I put into the Read_Var function ? I am completely new to this and it's just not clear to me. Thank you Wasan, I couldn't have asked for a better explanation. It worked but I had to offset the address by -1 (40001 = 0, 40002 = 1 etc.) to get a response otherwise it will return an error. Now, the next stage of my confusion, the value in the %MW I get back is random, anything from -322xx to +20000 or 30000. I was expecting something in line with the actual sensor measurement (pH), or do I need to scale it like a mA value ? If so could you please tell me the steps involved ? Also, is there a simple way to view what value is in a %MW while I am online during testing in somachine basic? So, a little update, I have managed to figure out how to display any floating point variable. Take Register #40005, Float, Length 2, according to slave's Modbus map. First, the ObjType is 0 - to access the 4xxxx registers like Wasan said. Then, in my case #40005 - sensor temp. I needed to offset by -1, so FirstObj will be 4. %MF2/%MD2 = %MW2 + %MW3 ---- %MF3/%MD3 = %MW3 + %MW4 etc. All I need to do is put the corresponding %MF in the animation table and boom....there's the sensor reading. Following on from that, can anyone tell me what to do with Register #40007, Data Type String, Length 6 ? 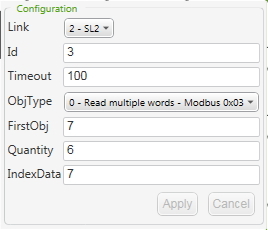 @JohnB315 For string variable you should use Animation Table to show them by Example I have input "TEST STRING" to M0 for 10 words by use %MW0:10 = "TEST STRING" in operation box. Then I create animation table for %MW0 to %MW10 then right click at %MW then select ASCII. They will show data in ASCII string by start from right to left and for each %MW can collect 2 character.